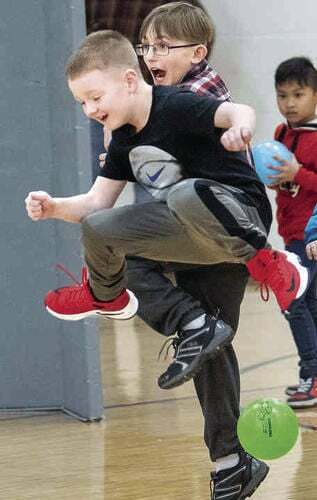 Robin Scholz/The News-Gazette Oakwood Elementary School second grader Kemper Hinchman shows how high he can jump to avoid getting hit by a ball as students who are in Project Success' 21st Century Learning Center program challenged the village police officers to a game of dodgeball. Behind him is Adlerr Hardy, 3rd grade. At the school on Tuesday, March 19, 2019. 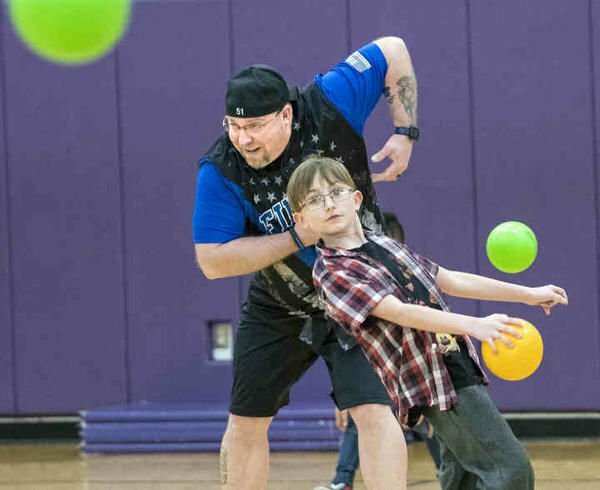 Robin Scholz/The News-Gazette Adler Hardy, 3rd grade, and Danville police officer Jason Dunavan play dodgeball as Oakwood Elementary School students who are in Project Success' 21st Century Learning Center program challenged the village police officers to a game of dodgeball. At the school on Tuesday, March 19, 2019. Robin Scholz/The News-Gazette Oakwood Elementary School students who are in Project Success' 21st Century Learning Center program challenged the village police officers to a game of dodgeball. At the school on Tuesday, March 19, 2019.